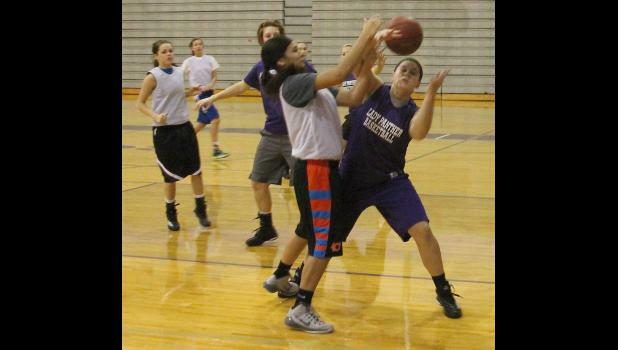 After a very successful fall sports season for the Lady Panthers, it’s no surprise the Royal Valley girls basketball program will be trying to build off that this winter. For the girls on the volleyball team that took third at state and even for those not on the team, RV coach Corey Katzer said they have taken that on as a motivator. “They were so excited for those kids on the volleyball team to have that experience that all they could talk about was that’s what they want and they’re willing to do whatever it takes,” Katzer said. That is especially good news for a coach like Katzer who is taking charge of the RVHS girls basketball team for the first time this season. While he is focused on implementing his system, he said having a group with such lofty expectations could mean good things for this team early on this season. Katzer had some insight on just what he was getting into as he took a teaching position at RVHS last year and got to observe the team from the stands for a season. A strong group of kids led the team to an 11-11 overall record and sub-state runner-up finish last season and many return for the 2014/2015 campaign, part of the reason Katzer was drawn to the job. In addition, Katzer said he “picked the brain” of his predecessor, Jason Grider, as well as assistant coaches Brad Alley and Kyle Porter regarding the potential of this team, which also helped attract him to the position. All three visions lined up as well, Katzer noted, and having input from three different head coaches (himself, Grider and Alley) was something he said has been really beneficial in taking over the program. The players and coach first got a crack at working together over the summer, both in camp and in summer league competition, and while Katzer said it is usually a rush to get as much of a new system in as possible, he has been pleased with what the players took away from the first impressions. Some of the upperclassmen in particular really honed in on the basics of the flex offense and run-and-jump defense Katzer is now implementing and have been helping the younger players adapt so far this season, acting as mediators between the coach to help facilitate the progress and understanding of the changes. The seniors have especially been key in that process. “What they’ve done from a leadership role, at this point, has been invaluable. They’ve gone above and beyond,” Katzer said. That experienced group, including returning starters Jaycee Worrell, Leslie Schuetz and Kassidy Dahl, provides a strong core to build from, but building depth is something Katzer said will be an important factor for the Panthers over the course of the season. “With the style that we’re going to play, we’re going to have to have a pretty strong second wave coming in, so to speak,” Katzer said. With the return of role players like Kate Hanson and Lexi Baker, the Panthers have a head start, but Katzer noted he will be looking for two to three more players to add to mix and create a strong, deep bench. Therein lies the real importance of the senior leadership, as Katzer noted there are some talented young players coming in who could make an impact. With the right group, that young talent can develop naturally and not feel overwhelmed and Katzer said this group is doing that and helping those young players come along. Katzer and his assistant coaches will help with that process, too, and he feels that player development could be a strength of the coaching staff. He spent 12 years doing just that as an assistant basketball coach at Ottawa High School before coming to RVHS, while Alley served as the head coach of the RVHS boys basketball program recently and Porter has helped coach middle school basketball at Royal Valley. While the players have high expectations this season, Katzer said he is keeping things thing simple and wants to see the team collectively get better everyday and if it does that then all that success may fall into place for the Panthers. Another trait that could help the Panthers as they strive for success on the hardwood is the tight bond the players already share, according to Katzer. This is a group that spends a lot of time together and Katzer said he and his coaching staff have already noted numerous times this year what a great group of kids Royal Valley has on the roster. That team mentality won’t be enough, though, especially in a competitive league like the Big Seven, but Katzer said if the Panthers can find a way to have some success there, then they will be well on their way to reaching the new heights the players are striving for this year. “If you come out of this league in the top three or four, you should go to sub-state with pretty high expectations,” Katzer said. Royal Valley has no shortage of those this winter, but Katzer is looking to take it one day at a time and just get from point A to point B as he continues to implement his system and bring the team along. There are some similarities to what Royal Valley has been doing for the past few seasons and Katzer said the players are adapting, but it is still a work in progress. While the Panthers are looking to harvest a lot from the fruits of their labor, Katzer said it will take some time and he will see where the team is at in its season-opener at Jeff West on Dec. 5 and just go from there.